Chevron Nigeria Limited JV Scholarship awards 2018/2019. Chevron Nigeria Limited is one of the world’s leading integrated energy companies producing safe, reliable energy now and for the future. It is a subsidiary of Chevron Corporation and one of the largest oil producers in Nigeria. It was previously operating in Nigeria under the business name of Gulf Oil Company until merger activities changed its name to Chevron Nigeria. After another merger by the parent company with Texaco, the Nigerian oil and gas assets of Texaco Overseas Petroleum Company of Nigeria were merged into Chevron. 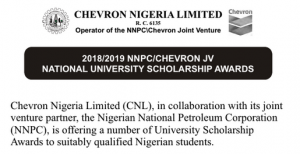 Chevron Nigeria Limited (CNL), in collaboration with its joint venture partner, the Nigerian National Petroleum Corporation (NNPC), is offering a number of University Scholarship Awards to suitably qualified Nigerian students. Applications close midnight of 10th August, 2018. Only shortlisted candidates will be contacted. PLEASE NOTE THAT APPLICANTS FOR THE NNPC/CNL JV SCHOLARSHIP ARE INELIGIBLE TO APPLY FOR ANY OTHER SCHOLARSHIP PROGRAM SPONSORED BY CHEVRON NIGERIA LIMITED (CNL), ITS JV PARTNER, NNPC, OR ANY OF ITS AFFILIATES, INCLUDING THE AGBAMI MEDICAL & ENGINEERING PROFESSIONAL SCHOLARSHIP (AMEPS) PROGRAM. Please note that only applications submitted through this web portal will be considered. Hard copies of any documents sent to any CNL locations or offices will not be processed. All interested students are advised to complete the e-application form online and upload all the required documents as requested at the web address indicated above. In line with our e-scholarship administration system, selected students will be invited for computer-administered qualifying tests in selected examination centers nationwide. Short-listed candidates for the qualifying test will be invited by email and SMS text messages. All applicants are therefore advised to ensure that their mobile phone numbers and personal email addresses are properly entered into the e-forms on the web site. Note: APPLICANTS AND SUCCESSFUL CANDIDATES ARE NOT REQUIRED TO MAKE ANY PAYMENTS WHATSOEVER DURING THE EVALUATION OR AWARD OF THE SCHOLARSHIP. Chevron Nigeria Limited, 2 Chevron Drive, Lekki Peninsula, P.M.B. 12825, Lagos. You can use the comment box for your comments and questions.